Acid hydrazides are vital chemical entities due to their biological activities. Upon complexation with certain metal ions, their biological activities are known to be positively enhanced. The present work describes the synthesis of Cr(III)-hydrazide complexes, and their structural, spectroscopic and antioxidant properties to reveal their chemistry and biochemistry. Physical (magnetic moment, conductivity measurements), analytical (C, H, N and Cr analysis) and spectral (EI-Mass, FTIR) techniques are used for the characterization of synthesized compounds. All Cr(III)-hydrazide complexes exhibit octahedral geometry with general formula [Cr(L)2(H2O)2]Cl3. In these complexes, the hydrazide ligands are coordinated via carbonyl oxygen and terminal amino nitrogen in a bidentate fashion. 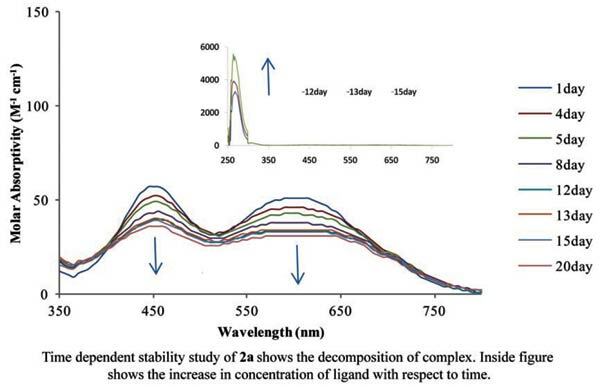 All Cr(III)-hydrazide complexes were screened for in vitro diphenyldipicryl hydrazine (DPPH), superoxide dismutase and nitric oxide radical scavenging activities. Majority of the Cr(III)-hydrazide complexes were found to be more potent scavengers than their uncoordinated hydrazide ligands. This study demonstrates an interesting structure-activity relationship (SAR) which is presented here. DPPH radical, superoxide, nitric oxide, antioxidants, chromium(III)-hydrazide complex. Department of Chemistry, University of Karachi, Karachi-75270, Pakistan.